On June 21st, 2005 Merrimack voters elected nine residents to evaluate the form of government used by the Town of Merrimack. These nine members invite you to use this online resource to track this process. On April 11th, Merrimack voters passed the proposed Charter. 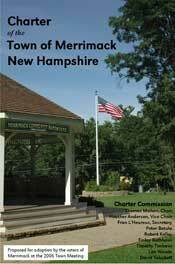 On May 25, 2006, the Merrimack Board of Selectmen formally accepted the Charter as required by law. Select the charter you would like to view, then click on View. A new browser window will be displayed with your selection. That same window will be used if you choose to view additional charters. This site serves many Adobe PDF, Microsoft Word, and Microsoft PowerPoint files. The below links will get you to their respective sites to download viewers for each format.